You'll be £12.99 closer to your next £10.00 credit when you purchase The 1984/85 Miners' Strike in Nottinghamshire. What's this? Order within the next 8 hours, 59 minutes to get your order processed the next working day! John Lowe was at the forefront of the fight for jobs during the twelve months of the miners' strike from 1984-5 as the elected chairman of Clipstone Colliery's strike committee in the largely working county of Nottinghamshire. The dirty war fought by the Thatcher Government to defeat the formidable National Union of Mineworkers transformed him from passive family man into political animal: witness to many disturbing events, he recorded his experiences in a diary so they would never be forgotten. There is the initial confusion and scramble to organise; the London rally which the police sought to turn into a riot; his arrest and fast-tracking through the court system; the legendary pensioner friend 'Sid' beaten black and blue at a police roadblock; unifying events such as Christmas; the slow trickle back to work; and finally, the dreaded day the strike ended – and first harrowing weeks back at the coalface among people he despised. With the scars left by the dispute still fresh upon him, he reflected upon events both at local and national level. If Spirit Alone Won Battles interweaves his diaries and this reflection is illustrated by an exhaustive collection of photographs, correspondence, court documents and campaign literature. It is a tale of heartbreak; but also a testament to the unquenchable spirit and stomach to fight of men and women with a just cause. Double page article in the Daily Mail conveying the hardships of the real day to day life of the miners during the 84/85 strike. Hard hitting. The Daily Mirror, March 2015. This is an inspiring book that deserves to be read widely, particularly in the Nottinghamshire area, which has never really recovered economically from the destruction of the coal industry. Whilst the full story of the strike and its aftermath in the Nottinghamshire Coalfield, including the final closures by the Major government, has yet to be told, this book will be an invaluable source and guide. I have just read If Spirit Alone Won Battles, the diary of a striking miner John Lowe by his grandson Jonathan Symcox. 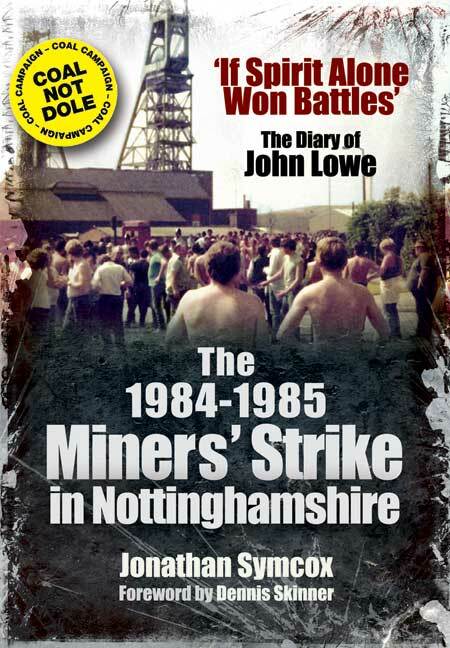 An Excellent foreword by Dennis Skinner sets the scene for a day-to-day account of the strike from John;s diaries. The book gives a graphic account of the highs and lows experienced by the striking miners and how they carried on their fight in spite of the overwhelming odd ahainst them. It is a must-read for all. BBC Radio Nottingham Interview - Interview with author Jonathan Symcox BBC Radio Nottingham. BBC Radio Mansfield Interview - Interview with author Jonathan Symcox on BBC Radio Mansfield. Sheffield-born Jonathan Symcox is the grandson of John Lowe and has long been fascinated by the 1984/85 miners' strike mainly through his grandfather's prolific writings. A novelist and ghost-writer in his spare time, he works as a journalist and chief sub-editor on the Yahoo! sports website in London.